The HEDI is a combination of structured and non-structured bag. It combines the advantages of both, mixing a pocket-shaped design with rounded edges, decorated with small details, it makes the bag look just perfect shape. It helps enhance your confidence every time you use and can be worn with all style in both workday and holiday. The design comes with a fully functional function that makes it easy to carry around. VERAPARIS also aim to design it finely so you can handle your busy day with a single bag weighing only 400 grams. Material - Made from genuine cowhide leather, Italian Cow Nappa Leather, from a long history of dyeing factory, which able to maintains its unique cowhide appearance with a slight spray of color to give the leather a soft, smooth texture. It also comes with VERA logo on the front. 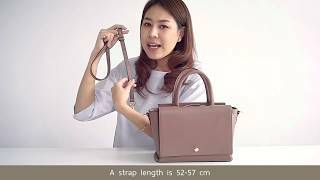 Size of bag: lid width 30 cm. (base width 23 cm.) x height 18 cm. x bag bottom 11 cm.